The Battle of the Somme (French: Bataille de la Somme, German: Schlacht an der Somme), also known as the Somme Offensive, was a battle of the First World War fought by the armies of the British and French empires against the German Empire. It took place between 1 July and 18 November 1916 on both sides of the River Somme in France. The battle was one of the largest of World War I, in which more than 1,000,000 men were wounded or killed, making it one of the bloodiest battles in human history. A Franco-British commitment to an offensive on the Somme had been made during Allied discussions at Chantilly, Oise, in December 1915. The Allies agreed upon a strategy of combined offensives against the Central Powers in 1916, by the French, Russian, British, and Italian armies, with the Somme offensive as the Franco-British contribution. The main part of the offensive was to be made by the French Army, supported on the northern flank by the Fourth Army of the British Expeditionary Force (BEF). When the German Army began the Battle of Verdun on the Meuse on 21 February 1916, many French divisions intended for the Somme were diverted and the supporting attack by the British became the principal effort. The first day on the Somme was a serious defeat for the German Second Army, which was forced out of its first line of defence by the French Sixth Army, from Foucaucourt-en-Santerre south of the Somme to Maricourt on the north bank and by the British Fourth Army from Maricourt to the vicinity of the Albert–Bapaume road. 1 July 1916 was also the worst day in the history of the British Army, which had c. 60,000 casualties, mainly on the front between the Albert–Bapaume road and Gommecourt, where the attack failed disastrously and few British troops reached the German front line. The British Army on the Somme was a mixture of the remains of the pre-war regular army, the Territorial Force and the Kitchener Army, which was composed of Pals battalions, recruited from the same places and occupations, whose losses had a profound social impact in Britain. The battle is notable for the importance of air power and the first use of the tank. At the end of the battle, British and French forces had penetrated 6 miles (9.7 km) into German-occupied territory, taking more ground than any offensive since the Battle of the Marne in 1914. The Anglo-French armies failed to capture Péronne and were still 3 miles (4.8 km) from Bapaume, where the German armies maintained their positions over the winter. British attacks in the Ancre valley resumed in January 1917 and forced the Germans into local withdrawals to reserve lines in February, before the scheduled retirement to the Siegfriedstellung (Hindenburg Line) began in March. General Sir Douglas Haig, the commander of the BEF, and General Henry Rawlinson, commander of the Fourth Army, have been criticised ever since, for the human cost of the battle and for failing to achieve their territorial objectives. On 1 August 1916 Winston Churchill criticised the British Army's conduct of the offensive to the British Cabinet, claiming that though the battle had forced the Germans to end their offensive at Verdun, attrition was damaging the British armies more than the German armies. Though Churchill was unable to suggest an alternative, a critical view of the British on the Somme has been influential in English-language writing ever since. A rival conclusion by some historians (Terraine, Sheffield, Duffy, Chickering, Herwig and Philpott et al.) is that there was no strategic alternative for the British in 1916 and that an understandable horror at British losses is insular, given the millions of casualties borne by the French and Russian armies since 1914. This school of thought sets the battle in a context of a general Allied offensive in 1916 and notes that German and French writing on the battle puts it in a continental perspective, which is inaccessible to anglophone monoglots because much of the writing has yet to be translated. The Battle of the Somme has been called the beginning of modern all-arms warfare, during which Kitchener's Army learned to fight the mass-industrial war, which the continental armies had been engaged in for two years. This view sees the British contribution to the battle as part of a coalition war and part of a process, which took the strategic initiative from the German Army and caused it irreparable damage, leading to its collapse in late 1918. Allied war strategy for 1916 was decided at the Chantilly Conference between 6–8 December 1915. Simultaneous offensives on the Eastern Front by the Russian army, on the Italian Front by the Italian army, and on the Western Front by the Franco-British armies, were to be carried out to deny time for the Central Powers to move troops between fronts during lulls. In December 1915, General Sir Douglas Haig replaced General Sir John French as Commander-in-Chief of the BEF. Haig favoured a British offensive in Flanders, close to BEF supply routes to drive the Germans from the Belgian coast and end the U-boat threat from Belgian waters. Haig was not formally subordinate to Joffre but the British played a lesser role on the Western Front and complied with French strategy. In January 1916, Joffre had agreed to the BEF making its main effort in Flanders, but in February 1916 it was decided to mount a combined offensive where the French and British armies met, astride the Somme River in Picardy before the British offensive in Flanders. A week later the Germans began an offensive against the French at Verdun. The costly defence of Verdun forced the French army to commit divisions intended for the Somme offensive, eventually reducing the French contribution to 13 divisions in the Sixth Army against 20 British divisions. By 31 May the ambitious Franco-British plan for a decisive victory had been reduced to a limited offensive to relieve pressure on the French army at Verdun by a battle of attrition. The Chief of the German General Staff, Erich von Falkenhayn intended to end the war by splitting the Anglo-French Entente in 1916, before its material superiority became unbeatable. Falkenhayn planned to defeat the large number of reserves, which the Entente could move into the path of a breakthrough by provoking the French into counter-attacking German positions, by threatening a sensitive point close to the existing front line. Falkenhayn chose to attack towards Verdun and take the Meuse heights making the city untenable. The French would have to conduct a counter-offensive, from ground dominated by the German army and ringed with masses of heavy artillery, leading to huge losses and bring the French army close to collapse. The British would then have to begin a hasty relief offensive and would also suffer huge losses. Falkenhayn expected the relief offensive to fall south of Arras against the Sixth Army and be destroyed. [Note 1] If such Franco-British defeats were not enough, Germany would attack both armies and end the western alliance for good. The unexpected length of the Verdun offensive and the need to replace many exhausted units at Verdun, depleted the German strategic reserve placed behind the Sixth Army (from Hannescamps, 18 kilometres (11 mi) south-west of Arras, and St. Eloi, south of Ypres) and reduced the German counter-offensive strategy north of the Somme to one of passive and unyielding defence. The Battle of Verdun (21 February–18 December 1916) began a week after Joffre and Haig agreed to mount an offensive on the Somme. The German offensive at Verdun was intended to threaten the capture of the city and induce the French to fight an attritional battle, in which German advantages of terrain and firepower would cause the French disproportionate casualties. The battle changed the nature of the offensive on the Somme, as French divisions were diverted to Verdun, and the main effort by the French diminished to a supporting attack for the British. German overestimation of the cost of Verdun to the French contributed to the concentration of German infantry and guns on the north bank of the Somme. By May Joffre and Haig had changed their expectations of an offensive on the Somme, from a decisive battle to a hope that it would relieve Verdun and keep German divisions in France, which would assist the Russian armies conducting the Brusilov Offensive. The German offensive at Verdun was suspended in July, and troops, guns, and ammunition were transferred to Picardy, leading to a similar transfer of the French Tenth Army to the Somme front. Later in the year the Franco-British were able to attack on the Somme and at Verdun sequentially and the French recovered much of the ground lost on the east bank of the Meuse, by counter-offensives in October and December. The Brusilov Offensive (4 June–20 September), absorbed the extra forces that had been requested on 2 June by General von Below, the Second Army commander, for a spoiling attack on the Somme. On 4 June, Russian armies attacked on a 200-mile (320 km) front, from the Rumanian frontier to Pinsk, and eventually advanced 150 kilometres (93 mi), reaching the foothills of the Carpathian mountains, against German and Austro-Hungarian troops of Armeegruppe von Linsingen and Armeegruppe Archduke Joseph. During the offensive the Russians inflicted c. 1,500,000 losses including c. 407,000 prisoners. Three divisions were ordered from France to the Eastern Front on 9 June and the spoiling attack on the Somme was abandoned. Only four more divisions were sent to the Somme front before the Anglo-French offensive began, bringing the total to 10+1⁄2 divisions. Falkenhayn and then Hindenburg and Ludendorff were forced to send divisions to Russia throughout the summer, to prevent a collapse of the Austro-Hungarian army and then to conduct a counter-offensive against Romania, which declared war against the Central Powers on 27 August. In July there were 112 German divisions on the Western Front and 52 divisions in Russia and in November there were 121 divisions in the west and 76 divisions in the east. The original British Expeditionary Force (BEF) of six divisions and the Cavalry Division, had lost most of the army's pre-war regular soldiers in the battles of 1914 and 1915. The bulk of the army was made up of volunteers of the Territorial Force and Kitchener's New Army, which had begun forming in August 1914. Rapid expansion created many vacancies for senior commands and specialist functions, which led to many appointments of retired officers and inexperienced newcomers. In 1914, Haig had been a Lieutenant-General in command of I Corps and was promoted to command the First Army in early 1915 and then the BEF in December, which eventually comprised five armies with sixty divisions. The swift increase in the size of the army, reduced the average level of experience within it and created an acute equipment shortage. Many officers resorted to directive command, to avoid delegating to novice subordinates, although divisional commanders were given great latitude in training and planning for the attack of 1 July, since the heterogeneous nature of the 1916 army, made it impossible for corps and army commanders to know the capacity of each division. Despite considerable debate among German staff officers, Falkenhayn continued the policy of unyielding defence in 1916. [Note 2] On the Somme front Falkenhayn's construction plan of January 1915 had been completed. Barbed wire obstacles had been enlarged from one belt 5–10 yards (4.6–9.1 m) wide to two, 30 yards (27 m) wide and about 15 yards (14 m) apart. Double and triple thickness wire was used and laid 3–5 feet (0.91–1.5 m) high. The front line had been increased from one trench line to three, 150–200 yards (140–180 m) apart, the first trench occupied by sentry groups, the second (Wohngraben) for the bulk of the front-trench garrison and the third trench for local reserves. The trenches were traversed and had sentry-posts in concrete recesses built into the parapet. Dugouts had been deepened from 6–9 feet (1.8–2.7 m) to 20–30 feet (6.1–9.1 m), 50 yards (46 m) apart and large enough for 25 men. An intermediate line of strongpoints (the Stutzpunktlinie) about 1,000 yards (910 m) behind the front line was also built. Communication trenches ran back to the reserve line, renamed the second line, which was as well-built and wired as the first line. The second line was beyond the range of Allied field artillery, to force an attacker to stop and move field artillery forward before assaulting the line. British intentions evolved as the military situation changed after the Chantilly Conference. French losses at Verdun reduced the contribution available for the offensive on the Somme and increased the urgency for the commencement of operations on the Somme. The principal role in the offensive devolved to the British, and on 16 June Haig had ordered that the objectives were to relieve pressure on the French at Verdun and inflict loss on the enemy. After a five-day artillery bombardment the British Fourth Army was to capture 27,000 yards (25,000 m) of the German first line from Montauban to Serre and the Third Army was to mount a diversion at Gommecourt. In a second phase the Fourth Army was to take the German second position, from Pozières to the Ancre and then the second position south of the Albert–Bapaume road, ready for an attack on the German third position south of the road towards Flers, when the Reserve Army which included three cavalry divisions, would exploit the success to advance east and then north towards Arras. The French Sixth Army, with one corps on the north bank from Maricourt to the Somme and two corps on the south bank to Foucaucourt would make a subsidiary attack to guard the right flank of the main attack made by the British. After the Herbstschlacht ("Autumn Battle") in 1915, a third defence line another 3,000 yards (2,700 m) back from the Stutzpunktlinie was begun in February and was almost complete on the Somme front when the battle began. German artillery was organised in a series of sperrfeuerstreifen (barrage sectors); each officer was expected to know the batteries covering his section of the front line and the batteries ready to engage fleeting targets. A telephone system was built, with lines buried 6 feet (1.8 m) deep for 5 miles (8.0 km) behind the front line, to connect the front line to the artillery. The Somme defences had two inherent weaknesses which the rebuilding had not remedied. The front trenches were on a forward slope, lined by white chalk from the subsoil and easily seen by ground observers. The defences were crowded towards the front trench, with a regiment having two battalions near the front-trench system and the reserve battalion divided between the Stutzpunktlinie and the second line, all within 2,000 yards (1,800 m) and most troops within 1,000 yards (910 m) of the front line, accommodated in the new deep dugouts. The concentration of troops at the front line on a forward slope guaranteed that it would face the bulk of an artillery bombardment, directed by ground observers on clearly marked lines. The first day on the Somme began 141 days of the Battle of the Somme and the opening day of the Battle of Albert. The attack was made by five divisions of the French Sixth Army either side of the Somme, eleven British divisions of the Fourth Army north of the Somme to Serre and two divisions of the Third Army opposite Gommecourt, against the German Second Army of General Fritz von Below. The German defence south of the Albert–Bapaume road mostly collapsed and the French had "complete success" on both banks of the Somme, as did the British from the army boundary at Maricourt to the Albert–Bapaume road. On the south bank the German defence was made incapable of resisting another attack and a substantial retreat began; on the north bank the abandonment of Fricourt was ordered. The defenders on the commanding ground north of the road inflicted a huge defeat on the British infantry, who had an unprecedented number of casualties. Several truces were negotiated, to recover wounded from no man's land north of the road. The Fourth Army lost 57,470 casualties, of which 19,240 men were killed, the French Sixth Army had 1,590 casualties and the German 2nd Army had 10,000–12,000 losses. In the Battle of Ginchy the 16th Division captured the German-held village. Ginchy was 1.5 kilometres (0.93 mi) north-east of Guillemont, at the junction of six roads on a rise overlooking Combles, 4 kilometres (2.5 mi) to the south-east. After the end of the Battle of Guillemont, British troops were required to advance to positions which would give observation over the German third position, ready for a general attack in mid-September. British attacks from Leuze Wood north to Ginchy had begun on 3 September, when the 7th Division captured the village and was then forced out by a German counter-attack. The capture of Ginchy and the success of the French Sixth Army on 12 September, in its biggest attack of the battle of the Somme, enabled both armies to make much bigger attacks, sequenced with the Tenth and Reserve armies, which captured much more ground and inflicted c. 130,000 casualties on the German defenders during the month. The Battle of Flers–Courcelette was the third and final general offensive mounted by the British Army, which attacked an intermediate line and the German third line to take Morval, Lesboeufs, and Gueudecourt, which was combined with a French attack on Frégicourt and Rancourt to encircle Combles and a supporting attack on the south bank of the Somme. The strategic objective of a breakthrough was not achieved but the tactical gains were considerable, the front line being advanced by over 2500–3500 yards (2,300–3,200 m) and many German casualties being inflicted. The battle was the début of the Canadian Corps, New Zealand Division and tanks of the Heavy Branch of the Machine Gun Corps on the Somme. The Battle of Morval was an attack by the Fourth Army on Morval, Gueudecourt and Lesboeufs held by the German 1st Army, which had been the final objectives of the Battle of Flers-Courcelette (15–22 September). The attack was postponed to combine with attacks by the French Sixth Army on Combles, south of Morval and because of rain. The combined attack was also intended to deprive the German defenders further west, near Thiepval of reinforcements, before an attack by the Reserve Army, due on 26 September. Combles, Morval, Lesboeufs and Gueudecourt were captured and a small number of tanks joined in the battle later in the afternoon. Many casualties inflicted on the Germans but the French made slower progress. The Fourth Army advance on 25 September was its deepest since 14 July and left the Germans in severe difficulties, particularly in a salient near Combles. The Reserve Army attack began on 26 September in the Battle of Thiepval Ridge. The Battle of Le Transloy began in good weather and Le Sars was captured on 7 October. Pauses were made from 8–11 October due to rain and 13–18 October to allow time for a methodical bombardment, when it became clear that the German defence had recovered from earlier defeats. Haig consulted with the army commanders and on 17 October reduced the scope of operations by cancelling the Third Army plans and reducing the Reserve Army and Fourth Army attacks to limited operations in co-operation with the French Sixth Army. Another pause followed before operations resumed on 23 October on the northern flank of the Fourth Army, with a delay during more bad weather on the right flank of the Fourth Army and on the French Sixth Army front, until 5 November. Next day the Fourth Army ceased offensive operations except for small attacks intended to improve positions and divert German attention from attacks being made by the Reserve/Fifth Army. Large operations resumed in January 1917. The Battle of the Ancre was the last major British operation of the year. The Fifth (formerly Reserve) Army attacked into the Ancre valley to exploit German exhaustion after the Battle of the Ancre Heights and gain ground ready for a resumption of the offensive in 1917. Political calculation, concern for Allied morale and Joffre's pressure for a continuation of attacks in France, to prevent German troop transfers to Russia and Italy also influenced Haig. The battle began with another mine being detonated beneath Hawthorn Ridge Redoubt. The attack on Serre failed, although a brigade of the 31st Division, which had attacked in the disaster of 1 July, took its objectives before being withdrawn later. South of Serre, Beaumont Hamel and Beaucourt-sur-l'Ancre were captured. South of the Ancre, St Pierre Division was captured, the outskirts of Grandcourt reached and the Canadian 4th Division captured Regina Trench north of Courcelette, then took Desire Support Trench on 18 November; large operations ended until January 1917. The British and French had advanced about 6 miles (9.7 km) on the Somme, on a front of 16 miles (26 km) at a cost of 419,654 British and 202,567 French casualties, against 465,181 German casualties. Until the 1930s the dominant view of the battle in English-language writing, was that the battle was a hard-fought victory against a brave, experienced and well-led opponent. Winston Churchill had objected to the way the battle was being fought in August 1916, Lloyd George when Prime Minister criticised attrition warfare frequently and condemned the battle in his post-war memoirs. In the 1930s a new orthodoxy of "mud, blood and futility" emerged and gained more emphasis in the 1960s when the 50th anniversaries of the Great War battles were commemorated. In the first 1916 volume of the British Official History (1932), J. E. Edmonds wrote that comparisons of casualties were inexact, because of different methods of calculation by the belligerents but that British casualties were 419,654, from total British casualties in France in the period of 498,054, French Somme casualties were 194,451 and German casualties were c. 445,322, to which should be added 27% for woundings, which would have been counted as casualties using British criteria; Anglo-French casualties on the Somme were over 600,000 and German casualties were under 600,000. The addition by Edmonds of c. 30% to German figures, to make them comparable to British criteria, was criticised as "spurious" by M. J. Williams in 1964. McRandle and Quirk in 2006, cast doubt on the Edmonds calculations but counted 729,000 German casualties on the Western Front, from July to December against 631,000 by Churchill, concluding that German losses were fewer than Anglo-French casualties but that the ability of the German army to inflict disproportionate losses, had been eroded by attrition. Sheffield wrote that the calculation by Edmonds of Anglo-French casualties was correct but the one for German casualties was discredited, quoting the official German figure of 500,000 casualties. In the second 1916 volume of the British Official History (1938), Miles wrote that total German casualties in the battle were 660,000–680,000. against Anglo-French casualties of fewer than 630,000, using "fresh data" from the French and German official accounts. In 1938 Churchill wrote that the Germans had suffered 270,000 casualties against the French, between February and June 1916 and 390,000 between July and the end of the year (see statistical tables in Appendix J of Churchill's "World Crisis") and 278,000 casualties at Verdun. Some losses must have been in quieter sectors but many must have been inflicted by the French at the Somme. Churchill wrote that Franco-German losses at the Somme, were "much less unequal" than the Anglo-German ratio. Doughty wrote that French losses on the Somme were "surprisingly high" at 202,567 men, 54% of the 377,231 casualties at Verdun. Prior and Wilson used Churchill's research and wrote that the British lost 432,000 soldiers from 1 July – mid-November (c. 3,600 per day) in inflicting c. 230,000 German casualties and offer no figures for French casualties or the losses they inflicted on the Germans. Sheldon wrote that the British lost "over 400,000" casualties. Harris wrote that total British losses were c. 420,000, French casualties were over 200,000 men and German losses were c. 500,000, according to the "best" German sources. Sheffield wrote that the losses were "appalling", with 419,000 British casualties, c. 204,000 French and perhaps 600,000 German casualties. In a commentary on the debate about Somme casualties, Philpott used Miles's figures of 419,654 British casualties and the French official figures of 154,446 Sixth Army losses and 48,131 Tenth Army casualties. German losses were described as "disputed", ranging from 400,000–680,000. Churchill's claims were a "snapshot" of July 1916 and not representative of the rest of the battle. Philpott called the "blood test" a crude measure compared to manpower reserves, industrial capacity, farm productivity and financial resources and that intangible factors were more influential on the course of the war. The German army was exhausted in 1916, had a loss of morale and the cumulative effects of attrition and frequent defeats, caused it to collapse in 1918, a process which began on the Somme, echoing Churchill that the German soldiery was never the same again. After the Battle of the Ancre (13–18 November 1916), British attacks on the Somme front were stopped by the weather and military operations by both sides were mostly restricted to survival in the rain, snow, fog, mud fields, waterlogged trenches and shell-holes. As preparations for the offensive at Arras continued, the British attempted to keep German attention on the Somme front. 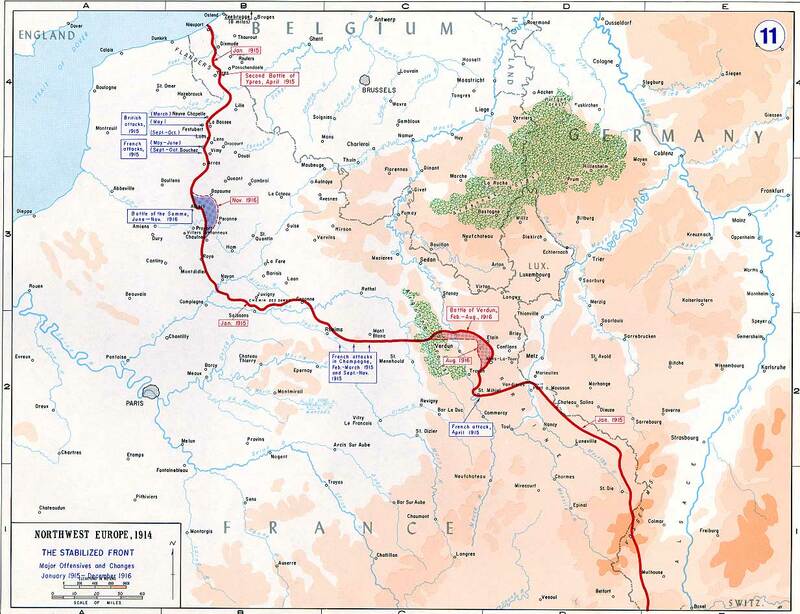 British operations on the Ancre from 10 January – 22 February 1917, forced the Germans back 5 miles (8.0 km) on a 4-mile (6.4 km) front, ahead of the schedule of the Alberich Bewegung ("Alberich Manoeuvre"/"Operation Alberich") and eventually took 5,284 prisoners. On 22/23 February the Germans fell back another 3 miles (4.8 km) on a 15-mile (24 km) front. The Germans then withdrew from much of the R. I Stellung to the R. II Stellung on 11 March, forestalling a British attack, which was not noticed by the British until dark on 12 March; the main German withdrawal from the Noyon salient to the Hindenburg Line (Operation Alberich) commenced on schedule on 16 March. The Royal British Legion with the British Embassy in Paris and the Commonwealth War Graves Commission, commemorate the battle on 1 July each year at the Thiepval Memorial to the Missing. For their efforts on the first day of the battle, The 1st Newfoundland Regiment was given the name "The Royal Newfoundland Regiment" by George V on 28 November 1917. The first day of the Battle of the Somme is commemorated in Newfoundland, remembering the "Best of the Best" at 11:00 a.m. on the Sunday nearest to 1 July. The Somme is remembered in Northern Ireland due to the participation of the 36th (Ulster) Division and commemorated by veterans' groups and by unionist/Protestant groups such as the Orange Order. During the Northern Irish Troubles the date was associated primarily with the Orange Order and regarded by some as part of the 'marching season', with connection to the Somme. The British Legion and others commemorate the battle on 1 July. ^ Despite the certainty by mid-June, of an Anglo-French attack on the Somme against the Second Army, Falkenhayn sent only four divisions, keeping eight in the western strategic reserve. No divisions were moved from the Sixth Army, despite it holding a shorter line with 17+1⁄2 divisions and three of the reserve divisions in the Sixth Army area. The maintenance of the strength of the Sixth Army, at the expense of the Second Army on the Somme, indicated that Falkehnayn intended the counter-offensive against the British to be made north of the Somme front, once the British offensive had been shattered. ^ Falkenhayn implied after the war that the psychology of German soldiers, shortage of manpower and lack of reserves made the policy inescapable, since the troops necessary to seal off breakthroughs did not exist. High losses incurred in holding ground by a policy of no retreat, were preferable to higher losses, voluntary withdrawals and the effect of a belief that soldiers had discretion to avoid battle. When a more flexible policy was substituted later, decisions about withdrawal still reserved to army commanders. ^ Hart 2006, pp. 27–37. ^ Hart 2006, p. 37. ^ Doughty 2005, p. 291. ^ Philpott 2009, pp. 81, 86. ^ Foley 2007, pp. 248–249. ^ Foley 2007, pp. 206–207. ^ Wynne 1939, p. 104. ^ Sheffield 2003, pp. 18–19. ^ Philpott 2009, pp. 412–413. ^ Dowling 2008, pp. xv, 163. ^ Sheffield 2003, p. 27. ^ Miles 1938, p. 555. ^ Simpson 2001, p. 34. ^ Sheldon 2005, p. 223. ^ Wynne 1939, pp. 100–101. ^ Miles 1938, p. 86. ^ Sheffield 2003, pp. 21, 64–65. ^ Wynne 1939, pp. 100–103. ^ Sheffield 2003, pp. 41–69. ^ Sheffield 2003, pp. 76–78. ^ Sheffield 2003, pp. 79–85. ^ Miles 1938, p. 133. ^ Philpott 2009, p. 251. ^ Sheffield 2003, pp. 94–95. ^ Sheffield 2003, pp. 94–96. ^ Sheffield 2003, pp. 98–100. ^ Philpott 2009, p. 355. ^ Sheffield 2003, pp. 112–124. ^ Philpott 2009, p. 383. ^ Miles 1938, pp. 458–459. ^ Miles 1938, p. 474. ^ Sheffield 2003, pp. 130–131. ^ Miles 1938, pp. 447–456 & 460–466. ^ Miles 1938, pp. 476–477. ^ McCarthy 1995, pp. 148–162. ^ Miles 1938, pp. 570–572. ^ Philpott 2009, pp. 150–151. ^ a b Sheffield 2003, p. 186. ^ Edmonds 1932, p. 483. ^ Prior & Wilson 2005, p. 119. ^ a b Sheffield 2003, p. 156. ^ Philpott 2009, pp. 436–437. ^ Duffy 2006, p. 326. ^ Sheldon 2009, p. 398. ^ Sheldon 2009, p. 4. ^ Sheldon 2009, pp. 4–5. ^ Miles 1938, p. xv. ^ Bond 2002, pp. 1–104. ^ Terraine 1963, p. 230. ^ Sheffield 2001, p. 188. ^ Duffy 2006, pp. 324, 327. ^ Chickering 1998, pp. 70–71. ^ Herwig 1996, p. 249. ^ Philpott 2009, p. 625. ^ Boraston 1919, p. 53. ^ Edmonds 1932, pp. 496–497. ^ Philpott 2009, pp. 601–602. ^ Sheffield 2003, p. 151. ^ Miles 1938, p. 553. ^ Churchill 1938, p. 1423. ^ Philpott 2009, pp. 600–602. ^ Churchill 1938, pp. 1427, 1004. ^ Churchill 1938, p. 966. ^ Prior & Wilson 2005, pp. 300–301. ^ Philpott 2009, pp. 602–603. ^ Boraston 1919, p. 64. ^ Falls 1940, p. 115. ^ Falls 1940, pp. 95–107. ^ Steele 2003, p. 10. ^ Steele 2003, p. 192. ^ Robinson 2010, pp. 86–87. Boraston, J. H. (1919). Sir Douglas Haig's Despatches (1920 ed.). London: Dent. OCLC 633614212. Chickering, R. (1998). Imperial Germany and the Great War, 1914–1918 (2nd, 2004 ed.). London: CUP. ISBN 0-52154-780-6. Doughty, R. A. (2005). Pyrrhic Victory: French Strategy and Operation in the Great War. Cambridge, MA: The Belknap Press of Harvard University. ISBN 0-67401-880-X. Dowling, T. (2008). 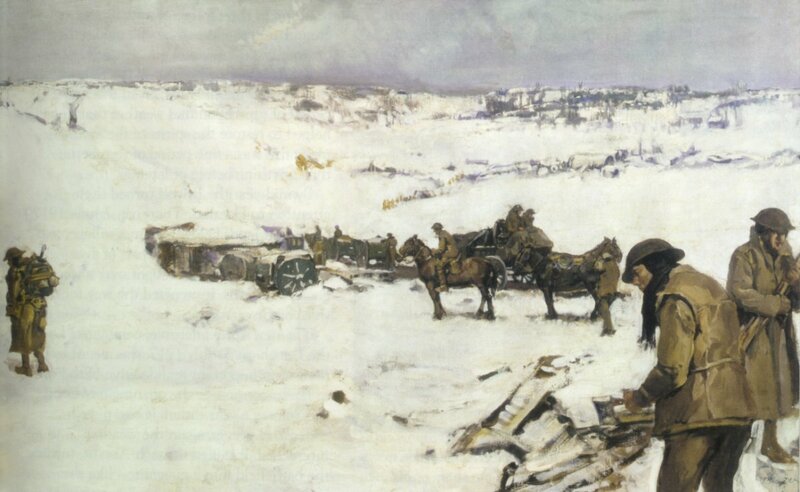 The Brusilov Offensive. Bloomington IN: Indiana University Press. ISBN 0-253-35130-8. Duffy, C. (2006). Through German Eyes: The British and the Somme 1916 (Phoenix 2007 ed.). London: Weidenfeld & Nicholson. ISBN 978-0-7538-2202-9. Edmonds, J. E. (1932). Military Operations France and Belgium, 1916: Sir Douglas Haig's Command to the 1st July: Battle of the Somme. History of the Great War Based on Official Documents by Direction of the Historical Section of the Committee of Imperial Defence. I (IWM & Battery Press 1993 ed.). London: Macmillan. ISBN 0-89839-185-7. Falls, C. (1940). Military Operations France and Belgium 1917: The German Retreat to the Hindenburg Line and the Battles of Arras. History of the Great War Based on Official Documents by Direction of the Historical Section of the Committee of Imperial Defence. I (IWM & Battery Press 1992 ed.). London: HMSO. ISBN 0-89839-180-6. Foley, R. T. (2007). German Strategy and the Path to Verdun: Erich von Falkenhayn and the Development of Attrition, 1870–1916. Cambridge: CUP. ISBN 978-0-521-04436-3. Harris, J. P. (2008). Douglas Haig and the First World War (2009 ed.). Cambridge: CUP. ISBN 978-0-521-89802-7. McCarthy, C. (1993). The Somme: The Day-by-Day Account (Arms & Armour Press 1995 ed.). London: Weidenfeld Military. ISBN 1-85409-330-4. Miles, W. (1938). Military Operations France and Belgium, 1916: 2nd July 1916 to the End of the Battles of the Somme. History of the Great War Based on Official Documents by Direction of the Historical Section of the Committee of Imperial Defence. II (Battery Press 1992 ed.). London: Macmillan. ISBN 0-901627-76-3. Sheffield, G. (2001). Forgotten Victory, The First World War: Myths and Realities (Review 2002 ed.). London: Hodder Headline. ISBN 0-7472-6460-0. Sheldon, J. (2005). The German Army on the Somme 1914–1916 (Pen & Sword Military 2006 ed.). London: Leo Cooper. ISBN 1-84415-269-3. Simpson, A. (2001). The Operational Role of British Corps Command on the Western Front 1914–18 (2005 ed.). London: Spellmount. ISBN 1-86227-292-1. http://ethos.bl.uk/OrderDetails.do?did=2&uin=uk.bl.ethos.367588. Retrieved 19 July 2014. Steele, O. W. (2003). Facey-Crowther, D. R.. ed. Lieutenant Owen William Steele of the Newfoundland Regiment: Diary and Letters. Montreal: McGill-Queen's University Press. ISBN 0-7735-2428-2. http://www.heritage.nf.ca/cns_archives/13riggsoct05_1995.html. Retrieved 8 August 2014. Terraine, J. (1963). Douglas Haig: The Educated Soldier (2005 ed.). London: Cassell. ISBN 0-304-35319-1. Wynne, G. C. (1939). If Germany Attacks: The Battle in Depth in the West (Greenwood Press 1976 ed.). London: Faber. ISBN 0-8371-5029-9. Robinson, H. (2010). "Remembering War in the Midst of Conflict: First World War Commemorations in the Northern Irish Troubles". 20th Century British History XXI (1). DOI:10.1093/tcbh/hwp047. ISSN 1477-4674. McMullin, R. (2006). "Disaster at Fromelles". AU: Australian War Memorial. ISSN 1328-2727. http://www.awm.gov.au/wartime/36/article.asp. Retrieved 14 April 2007. "The South Africans at Delville Wood". Military History Journal (S Afr MHJ). The South African Military History Society. ISSN 0026-4016. Archived from the original on 25 July 2009. http://samilitaryhistory.org/vol072iu.html. Retrieved 23 July 2009. "The Somme in Oral Histories of the First World War: Veterans 1914–1918". Ottawa: Library and Archives Canada. OCLC 439730254. http://www.collectionscanada.ca/first-world-war/interviews/025015-1400-e.html. Retrieved 9 September 2009. Ball, S. (2004). The Guardsmen. HarperCollins. ISBN 978-0-00-653163-0. Buchan, J. (1917). The Battle of the Somme. New York: George H. Doran. OCLC 699175025. Gilbert, M. (1994). The Somme: Heroism and Horror in the First World War (2006 ed.). Henry Holt and Company. ISBN 0-8050-8127-5. Histories of Two Hundred and Fifty-One Divisions of the German Army which Participated in the War (1914–1918). Washington: United States Army, American Expeditionary Forces, Intelligence Section. 1920. ISBN 5-87296-917-1. http://ia700306.us.archive.org/10/items/historiesoftwohu02unit/historiesoftwohu02unit.pdf. Retrieved 13 September 2013. James, E.A. (1924). A Record of the Battles and Engagements of the British Armies in France and Flanders 1914–1918. Aldershot: Gale & Polden. OCLC 250857010. Jones, H. A. (1928). The War in the Air, Being the Story of the Part Played in the Great War by the Royal Air Force. II (N & M Press 2002 ed.). London: Clarendon Press. ISBN 1-84342-413-4. https://ia801609.us.archive.org/29/items/warinairbeingsto02rale/warinairbeingsto02rale.pdf. Retrieved 9 August 2014. Liddell Hart, B. H. (1970). History of the First World War (3rd 1973 ed.). London: Book Club Associates. OCLC 819218074. Masefield, J. (1917). The Old Front Line. New York City: Macmillan. OCLC 1183536. http://ia600303.us.archive.org/11/items/oldfrontline01mase/oldfrontline01mase.pdf. Retrieved 27 June 2013. Nicholson, G. W. L. (1962). "Canadian Expeditionary Force 1914–1919". Official History of the Canadian Army in the First World War. Ottawa: Queen's Printer and Controller of Stationary. OCLC 557523890. http://www.cmp-cpm.forces.gc.ca/dhh-dhp/his/docs/CEF_e.pdf. Retrieved 27 December 2012. Nomenclature Committee as Approved by Army Council (1922). Cmnd 1138. ed. Report of the Battles of the Somme (N & M Press 1994 ed.). London: HMSO. ISBN 1-84342-196-8. Recouly, R. (1920). Jones, Mary Cadwalader. ed. Foch, The Winner of The War. New York: Charles Scribner's Sons. OCLC 2036520. Robertshaw, A. (2006). Somme 1 July 1916: Tragedy and Triumph. Osprey Publishing. ISBN 1-84603-038-2. Statistics of the Military Effort of the British Empire During the Great War 1914–1920 (1st ed.). London: HMSO. 1922. OCLC 1318955. http://ia700607.us.archive.org/5/items/statisticsofmili00grea/statisticsofmili00grea.pdf. Retrieved 27 June 2013. Van Hartesveldt, F. R. (1996). Online edition "The Battles of the Somme, 1916: Historiography and Annotated Bibliography". Westport, CT: Greenwood Press 1996. ISBN 0-31329-386-4. http://www.questia.com/read/23324074/the-battles-of-the-somme-1916-historiography-and Online edition. Retrieved 27 June 2013. This page uses content from the English language Wikipedia. The original content was at Battle of the Somme. The list of authors can be seen in the page history. As with this Familypedia wiki, the content of Wikipedia is available under the Creative Commons License.